I really wanted to cook a pot roast, but oh my goodness, the prices of pot roasts were unbelievable. What happened to a good price for a supposedly lesser cut of beef? So I ended up buying a 3 lb. turkey breast with a bone. It was well priced. Turkey breasts can be so dry sometimes so I thought that I would experiment and try to cook it in a way to increase the moistness. Indeed, the way I cooked it worked however, that little blue button that was inserted—supposedly to tell you when it’s done—no way. So, beware because it’s not always correct. Wash the breast, wipe it dry and season it with S&P and some Italian Seasoning. In a large oven proof skillet, melt the butter or heat the olive oil over medium high heat. Add the vegetables and sauté them for about 5 minutes—till they are glistening but not browned. Remove and set them aside. 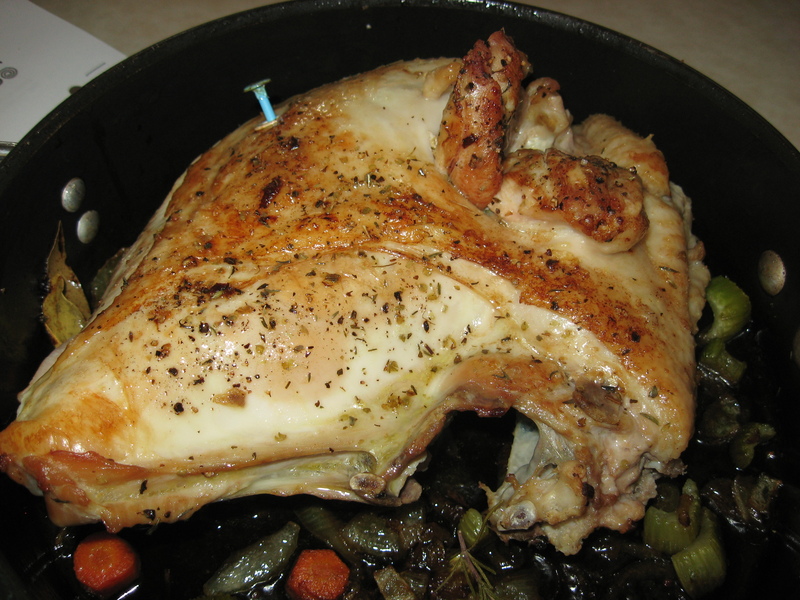 In the same skillet, over medium heat, brown the turkey breast that you have seasoned with S&P and Italian seasoning. Brown each side for about 4 minutes per side. 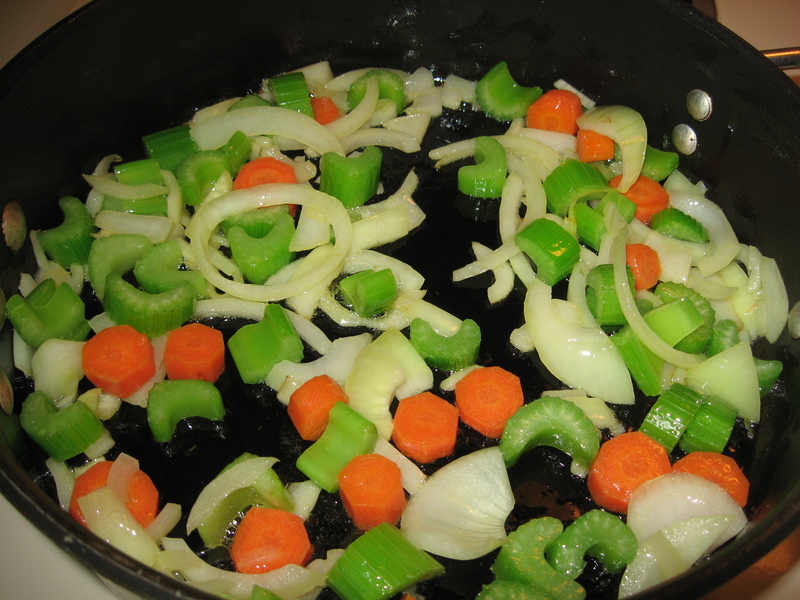 Set aside the breast and place the veggies back in the skillet. Then place the breast over them. Add the bay leaf and rosemary sprig. At this point, I sprayed some olive oil cooking spray over the breast. Place the skillet in the oven. I figured that it would take 1 ½ hour to cook (30 min. per lb.). 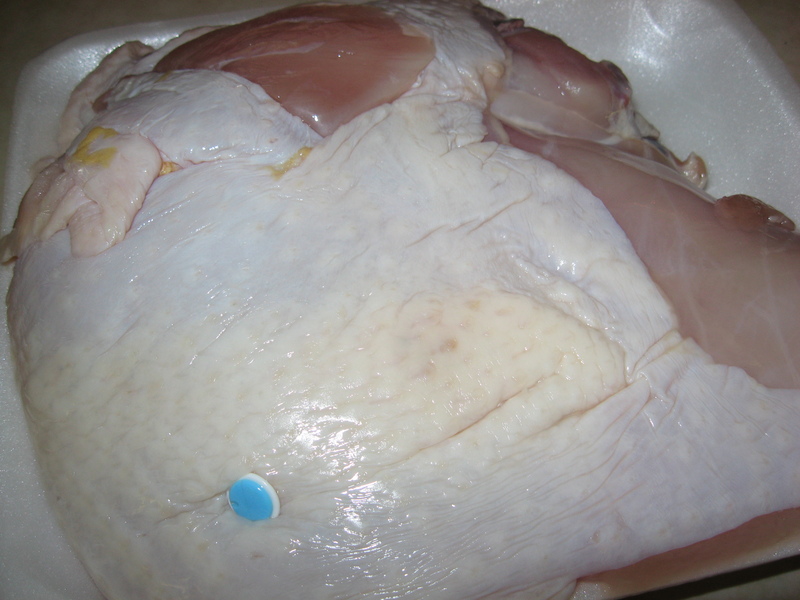 Every 15 minutes or so, I would baste the breast with the drippings and at the 1 hour point, the blue button popped out. So, of course, I cut into the breast and no way, Jose—it was not done. It did take another half-hour. But all in all, this was an easy way to cook a turkey breast and it turned out super moist and tender.